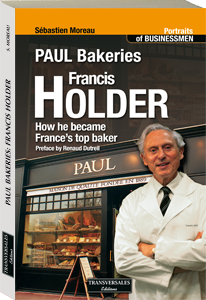 The son of a baker from Lille, Francis Holder began his apprenticeship in the family bakery at the age of 15. He took over the bakery at the age of 18, upon his father's death. Today, at 66, his company includes 341 PAUL shops in France and abroad. Now the largest French "baker", he sells more than 13,000 bread products an hour! Other than his star brand PAUL, the Holder conglomerate that he founded expanded the famous Ladurée salon de thé chain and the network of Saint-Preux bakeries as well. Holder is now at the head of an empire with annual sales of 225 million euros and 6,429 employees. Now the story of this model businessman's journey to success is being told for the first time: from his first ideas to his various successes, and his failures along the way, he shares, simply and directly, all the big moments of his great adventure.